Brett Allen Myers is no longer a Philadelphia Phillie. He will though remain a popular ex-Phillies pitcher in my opinion, that is of course he pitches for another team that the Phillies are facing in the playoffs or something. 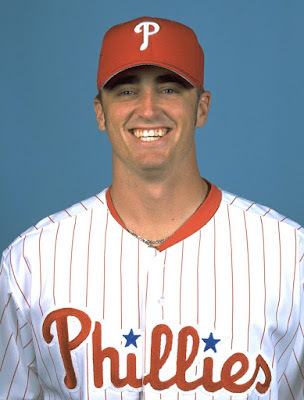 Myers colorful career with the Phillies did not take long to come to a crashing end though. Just days after the World Series loss by the Phillies, Myers was informed by Ruben Amaro Jr. that he wouldn’t be back. Myers took delight in drenching Amaro with champagne during the playoffs in the Division Series in the locker room. He was left off of the NLCS roster and rejoined the team for the World Series, but only pitched 1.0 innings in the 2009 World Series. He’s certainly been one of the more durable pitchers the Phillies have had and went from starter to bullpen when asked by the team without hesitation. His career is far from over, but the Phillies felt they didn’t have a spot for him in 2010. Brett Myers found a lot of the negative spotlight over the years in Philly, and the highlight of these incidents may have been when Myers allegedly struck his wife on the street in Boston a few years ago during an argument. He got over this, and several other situations that he probably wasn’t proud of. We’ll see what happens to Myers wherever he lands, hopefully he won’t land with the Mets or Braves, but you never know. Phillies pitchers have a knack for coming back to face their old team from time to time. Take Randy Wolf, and Vincente Padilla for instance for the Dodgers.